The Ouseburn is one of the most up-and-coming places in Newcastle. 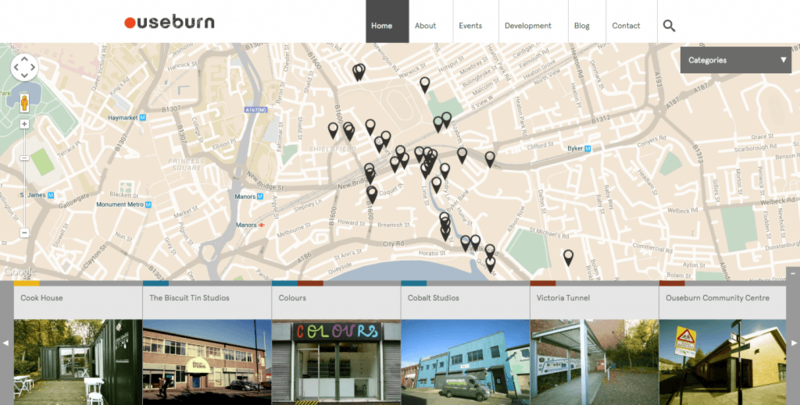 TAC Design, based near the Ouseburn, have created a directory of food, music, art and activities in the area. I created an easy-to-use interface in the WordPress admin in order to add the name, email address and website of the company as well as a UI to correctly position the marker icons on the map. Once the address has put in, the marker can be moved manually to ensure it’s in exactly the right place. Because the default zoom of the map is quite low and because there are lots of businesses in the same vicinity it’s important the markers are accurate. With Steve you get far more than just a Freelance Web Developer. We always like to get him onboard early in a project as his experience and WordPress expertise has a huge contribution to every phase, from scoping to deployment. Steve’s flexibility, attention to detail and problem solving abilities allow us to deliver complex, highly optimised solutions and custom functionality, not only on The Ouseburn, but to many of our other high-profile clients too. Steve is and will continue to be our go-to guy for bespoke WordPress development. In order to display the markers on a map I worked with the Google Maps API. The markers are geo-encoded from the address and are then added to the map. Additionally the user is able to remove certain categories of businesses which means live interactions with the map to remove and show the markers. Finally, there were some animations applied to the markers for them to bounce when the user hovers over the business listings, try it for yourself! I’ll certainly be spending more time down at the Ouseburn as it continues it’s regeneration and am on hand to help Tac to make the site even more useful for visitors to the area.